Dr. Gasper, my doctor, went over my blood work with me, and for someone who is, ahem, carrying a little more weight than she should, I am in amazingly good health. I suppose it must be partially genetic and also partly because that even though I eat more than I should—I am a good eater, after all—I do eat well, with plenty of fruit and vegetables in my daily diet, very little red meat, and a fair amount of olive oil. Then we moved on to a topic that has dominated my life for the past six years—breast cancer. In the summer of 2010, I was diagnosed with this disease. Fortunately, the cancer was slowing growing and lazy, both very good qualities when they’re applied to cancer. I had a lumpectomy and radiation. Chemotherapy was not needed. Dr. Gasper, that rare doctor who actually has a calming effect on people, looked at me and smiled. “You are considered cured,” he said. Cured! What a wonderful word. Now, Dr. Gaspar wasn’t telling me anything I didn’t know. At the Cancer Center in Augusta, after five years, I was given the option of going to my primary care physician for yearly check-ups, and that’s exactly what I decided to do. I will not miss those trips to the Cancer Center, and going to my regular doctor makes me feel like a regular person, which, after breast cancer, is a wonderful way to feel. But to hear my doctor say those words—“You’re cured”—well, it was as though he had given me a gold star. After I left, feeling oh-so-happy, I reflected on the power of words and their ability to either bolster us or drag us down. Kind words, even if they are true and self-evident, can ripple forward for years, leaving a good impression in our memories. They can steer us in the right direction and help us to think better of ourselves. Going forward, I will be more mindful of what I say. Are my words kind or unkind? Do they help or hurt? Even if they are true, do they need to be said? A final lesson for me: No matter how old we are, we can always learn to become more mindful. And more kind. At the little house in the big woods, whatever the season, the backyard is aflutter with birds, and it gives me great joy to watch them as they flit from the trees to the bird feeder. 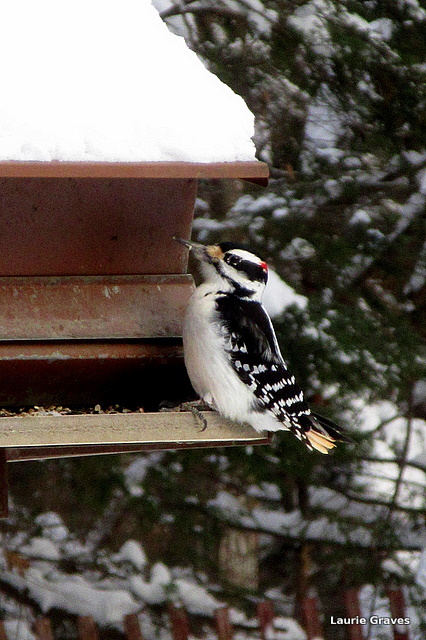 Finches, woodpeckers, chickadees, nuthatches, and many other birds come to eat. Our friends Beth and John are just as crazy about birds as we are, and last year on a warm spring day, we spent a happy afternoon on the patio, watching the birds. In the winter, of course, I watch from inside, often as I am doing dishes. 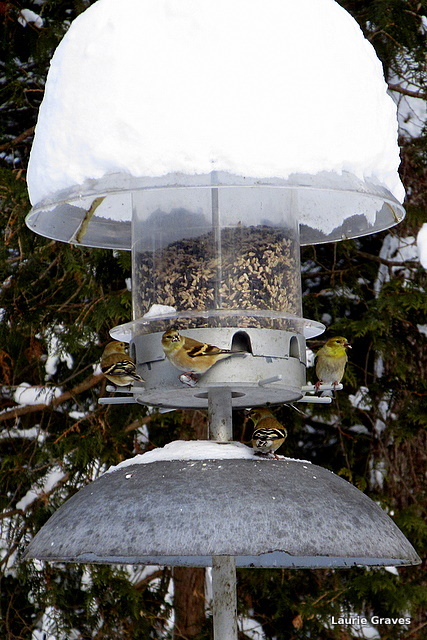 Winter is a hungry time for birds, and there are always a lot clustered at the feeders. The other day, as I was watching the birds in the backyard, I remembered the time I freed the birds at Woolworth’s in Waterville. I was three or four years old, and in those far-gone, innocent times, I was allowed to look at the toys and the pet section by myself while my mother did her shopping. I was a quiet child. not prone to running around and screaming and breaking things. My mother felt as though she could trust me, but you know what they say about the quiet ones. On the day I set the birds free, I watched the bright fish swim in their tanks and listened to the bubbling sound that came from the water. I admired the silky hamsters, curled in a ball, their little noses twitching from time to time. Then I came to the birds, tweeting and jumping in their cages. I remember feeling sorry for them, trapped in such a small space. Without hesitation, I undid the latch of one the cages and opened the door. With a swoosh, the birds flew from the cage, and their quick motion startled me, making me realize that what I had done was probably not a good thing, at least from the store’s point of view. I found my mother, but I didn’t tell her about the birds until we were at the lunch counter, and two parakeets went by. “Shush,” she said, and I could see that she was trying not to smile. Our food came, and as we ate, birds flew over our heads, and I could hear them twittering. No doubt they were eventually caught and returned to their cages. But for a short time, anyway, they had escaped their confinement and did what birds are born to do—fly. When we got home, my mother scolded me, just a little, telling me I was never to let the birds out again, and I didn’t. But to this day, I see my younger self and my quick little fingers, unlatching the cage door and letting the birds fly free. And it still makes me smile to think of it. With a new Star Wars movie due this December, it somehow seems appropriate to reminisce about the original Star Wars movie. Thirty-eight years ago, Dee attended that first Star Wars movie when it came to the Bangor area in either July or August—here my memory fails me—and I was either seven or eight months pregnant with her. Readers, I have a confession to make. I was not eager to see Star Wars. I was hot, cranky, large, and uncomfortable. There would be a long line, I knew, and I did not want to stand in it. But Clif and a friend worked on me until I agreed to go. At the cinema, standing in that long line, I was so amazed by the crowd and the excitement that I forgot to be cranky. 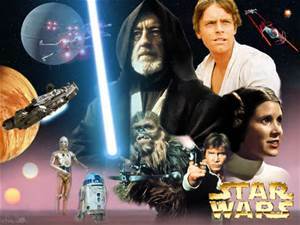 The cinema, of course, was absolutely packed, and with the opening crawl of the text, “A long time ago in a galaxy far, far away” combined with John William’s grand music, I was completely transfixed. I knew I was in once-upon-a-time territory, one of my favorite places to be. (I like to note that I was born in County Tolkien.) Then came the zooming of the spaceships, and I felt as though a current was going through my body. This sort of experience—this jolt—only happens every so often to me, when I am incredibly moved by a painting, some music, a book, or a movie. Did that jolt affect Dee? Who can say? But she loves paintings, books, music, and, especially, movies. (Dee is a true cinephile and makes me look like a piker.) When she was in fourth grade or so, she became an ardent fan of Doctor Who, and one year for Halloween Dee dressed up as the fourth doctor played by the inimitable Tom Baker. 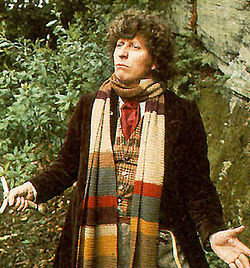 We bought Dee a curly wig, found a long scarf and sports coat, and voilà, we had a pretty good mini Doctor Who. It would be fitting if Dee’s favorite Star Wars movie were that first one we saw in 1977. Instead, she prefers The Empire Strikes Back, which seems to be a favorite with many of her generation. Life is like that—it does not always conform to perfect symmetry. Anyway, a very happy birthday to Dee. May the force be with you now and always. Yesterday, I went to the dentist’s office to have my teeth cleaned, and while I was there, I had X-rays. Clif will be retiring from his job the end of September, which means no more dental insurance. I figured that if any work needed to be done, then September was the month to do it. Well, good thing I had those X-rays. As it turns out, I need to have a tooth extracted, and I need a new crown. All will be done around my birthday. Happy birthday to me! My teeth are naturally straight, and even though they are a little yellow from all the tea I drink, they look pretty good. However, sometimes looks can be deceiving. Every two years, I have X-rays, and they inevitably show that something must be done to Laurie’s teeth. In the past, it was fillings. Now, it is crowns, and with this new one, I will have had five crowns. As for the extracted tooth…it is going from the bottom and cannot be fixed. Our out-of-pocket cost for the five crowns has been about $2,500. What a nice Canon camera I could get for $2,500. I know. Teeth are important, but I can’t help feeling a little wistful about the money spent. When I came home, I told Clif about my teeth, and while he agreed with my assessment about the money, he was philosophical about the matter. “You need your teeth,” he said. After discussing teeth, Clif mowed the front lawn, and I tidied the patio and back garden. 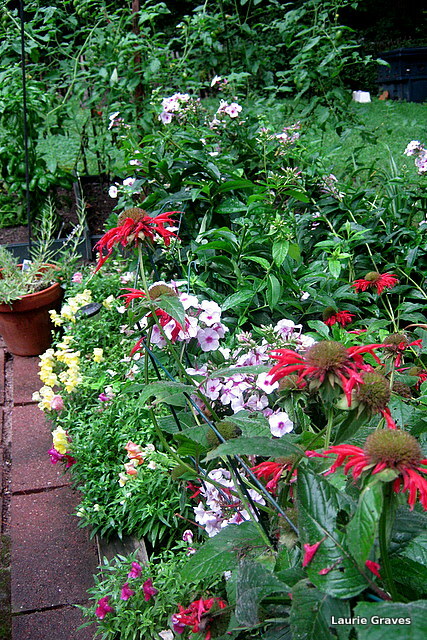 I cut back the phlox so that it wasn’t leaning over the dwarf snapdragons and touching the patio. 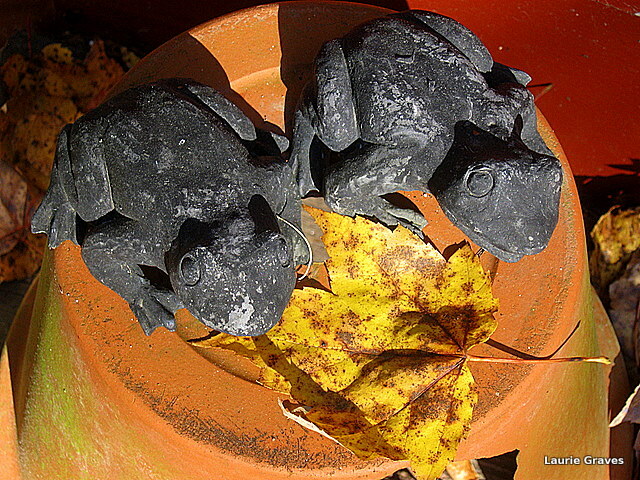 Afterwards, I propped them up with green wire fencing. I swept the patio and cut some of the spent stalks from the daylilies. 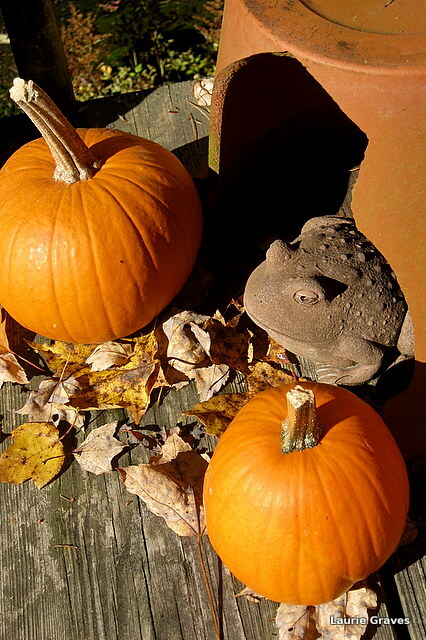 The garden still looked ragged, but it was a decided improvement. At least things were tidy. More or less. The sky was clear, the sun was setting, and Clif and I decided it would be an ideal time to have drinks on the patio. We both know we only have a month, at best, where we will be able to do this. We talked about my teeth, his retirement, and our sidelines—selling photo cards, computer consulting, and the strong possibility of a book being published in 2016. Our card business has begun to pick up, and we are excited about all our ventures. As Katherine White would put it, onward and upward. Even the prospect of dental work couldn’t dim our enjoyment of the evening. The tidy garden. More or less.